to learn about EagleChild's music and teachings. Eagle Child of Saddle Lake Cree Nation was born in Alberta, Canada. While growing up in Edmonton he was active in sports and came within reach of professional sports in baseball, hockey, and football. His involvement in sports took him to the University of Alberta where he graduated with a Bachelor of Education. Eagle Child’s spiritual journey began in Calgary. As President of the Plains Indian Cultural Survival School in Calgary, where he expanded his knowledge of the Native culture, Eagle developed and honed his presentation on “The Sacred Circle”. While in Calgary he learned the art of silversmithing and created the beautiful “Good Medicine” Sterling Silver Jewelry, an art form that only Eagle Child designed and handcrafted. 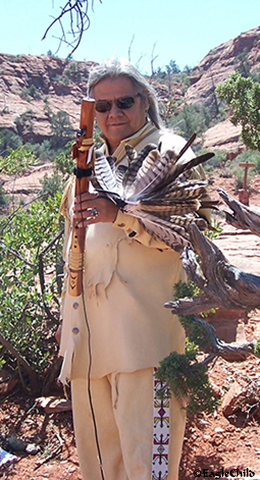 When his journey took him to Sedona, Arizona, Eagle Child taught himself to play the Native Flute. Here he shared his music, jewelry, and Native traditions to many while driving tours to the Grand Canyon and to various sites around Sedona. He also played at weddings, banquets, and resorts in the Sedona area. Upon his return to Vancouver, Canada, Eagle Child continued to create the beautiful healing jewelry. He also played the Native flute at many venues on Vancouver Island and the Sunshine Coast, as well as at various Native markets including Klahowya Village in Stanley Park. Eagle Child was an inspirational speaker and a healing facilitator who incorporated his Native flute music with Elder counseling and workshop presentations. He always enjoyed playing the Native flute and was always willing to share what he knew about numerology and earth astrology. EagleChild passed away in 2017. His Native flute music is a living tribute of an Authentic Indigenous man who genuinely touched those who were blessed to hear his beautiful music. And he truly believed in the healing energy of harmlessness, the illumination of the Eagle. Eagle’s Native flute MUSIC and message of HARMLESSNESS are his legacy. He wanted the world to hear his beautiful music and his message because he believed Mother Earth and the world the human beings have created need to be healed. May his celestial music and his timeless message of harmlessness speak to our hearts. All photos, graphics, and information on the "eaglechild.com" website are property of EagleChild.